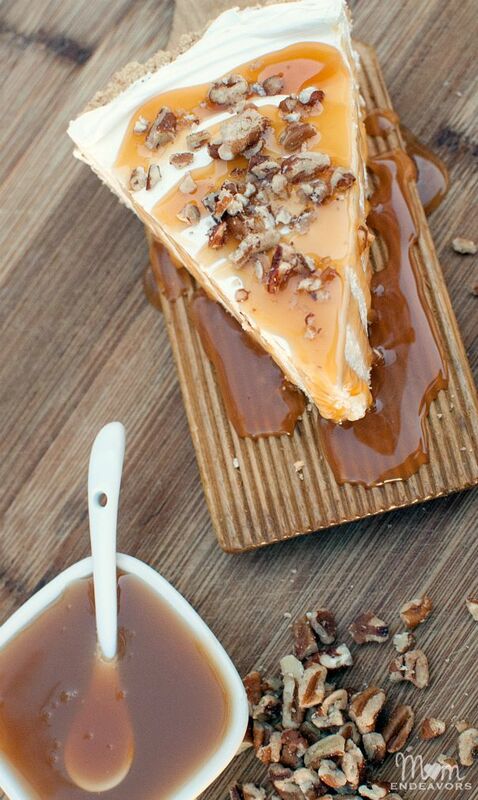 This caramel pecan cheesecake is super delicious and SO easy to make! 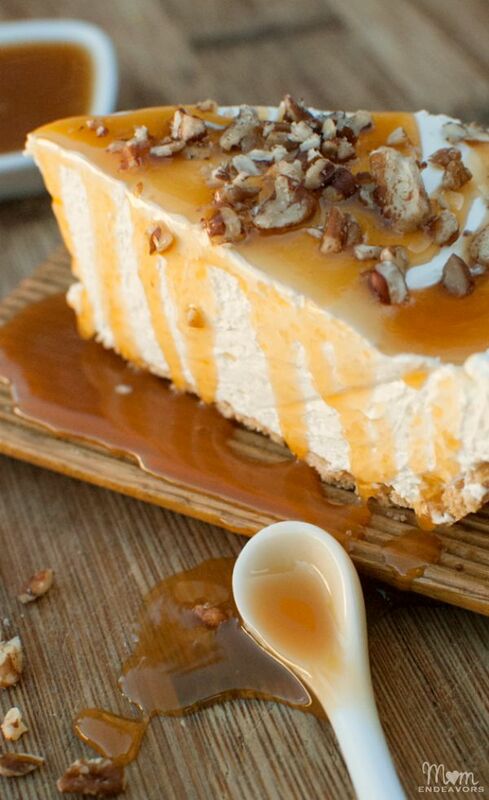 A rich & creamy dessert, this no-bake caramel pecan cheesecake is certain to wow your family & friends. Thaw the tub of whipped topping, and bring the cream cheese to room temperature. In a mixer, whip the cream cheese until fluffy. Add the icing sugar and continue to whip until incorporated. Gently fold it into the graham cracker crust, smoothing the filling with a spatula. Cool in the refrigerator until set (at least 3 hours or overnight). After cheesecake is set, you may choose to cut the cake into individual servings and garnish separately, or spread both the caramel and pecans over the entire cake before serving. For the graham cracker crust, you can make your favorite homemade recipe or buy an already prepared crust from the store. YUM!!!! Be sure to pin this one to save it for later! And, if you’re not a big caramel and/or pecan fan, this no-bake cheesecake would be great with fruit topping. You could try this homemade strawberry sauce, peach jam sauce, plum sauce, or even this warm berry compote. Delish!!! What’s YOUR favorite cheesecake topping? Great looking cheese cake with perfect medley of flavors. What a delicious combination, looks amazing! Looks amazing and sounds simple to make! My hubby would LOVE this! Pinning for later! Found you on Tutorial Tuesday! I think I would eat this whole thing by myself! It looks wonderful. Pinned, yummed, and stumbled. OMG this looks so amazing. I have a friends housewarming in a couple weeks, and this would be the perfect treat to bring along! Your cheesecake looks so good! 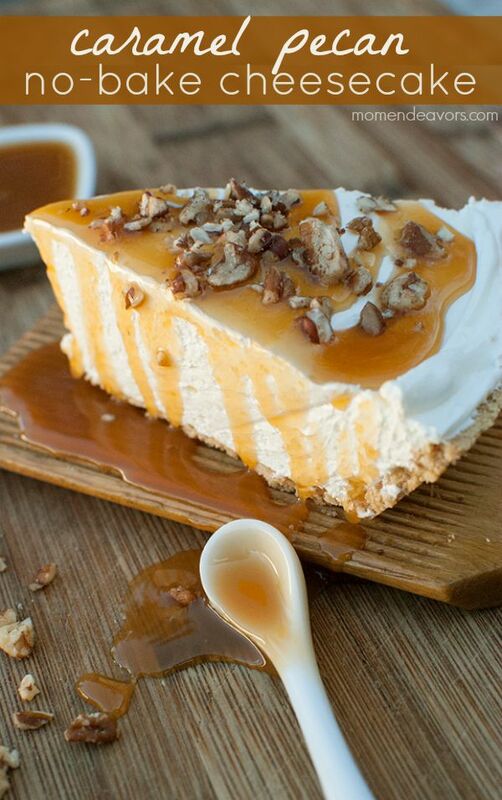 No-bake with caramel and pecans, yes please! Oh goodness! This looks delicious! I will be making this soon as a special treat! This looks scrumptious! I haven’t heard of this combination before, so I can’t wait to try it! Any chance you’d consider letting me post your article on my blog 100Things2Do.ca? All links and credit will go directly to you. Found you through Craftberry Bush. Sara this looks so good!! Oh my gosh, this looks so good! I’m so tempted to make this tomorrow. I’ve never tried cheesecake with a caramel topping. Yum! Thank you for sharing at Inspire Me Wednesday. Featuring you in this week’s issue (and on Instagram) tomorrow! What do you mean by brick of cream cheese?? 8oz or 16oz? Please and thank you! !